The new Williams Hall greenhouse complex on OARDC’s Wooster campus is more than a replacement for the greenhouses lost to a tornado five years ago: It’s a state-of-the-art facility that will help advance plant research and strengthen Ohio agriculture. The original Williams Hall greenhouse complex was leveled by a September 2010 tornado that destroyed or damaged many other buildings on the campus. The new greenhouses became operational in late 2014. 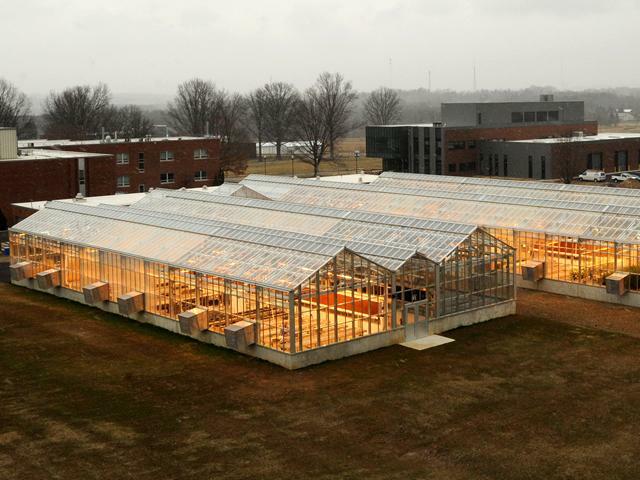 The new complex includes 14,400 square feet of space for conducting greenhouse research and for growing plants for laboratory-based research projects. The facility is divided into 14 bays, 24 feet by 40 feet each; and two smaller bays, 24 feet by 20 feet each. The greenhouses are controlled by an Argus Titan 2 environmental control system. The system allows researchers to independently control the environmental parameters for their experiments and plants. The greenhouses serve programs in the Department of Horticulture and Crop Science and the School of Environment and Natural Resources. To contact the source: Michelle Jones at jones.1968@osu.edu.